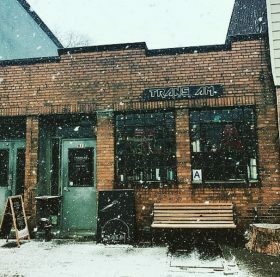 This morning, Trans-Pecos announced that a collaboration with Seitan’s Helper will come to the Trans Am Cafe space as a two-week pop-up. Seitan’s Helper is a vegan seitan deli meat provider run by queer vegan women that has held pop-ups across Brooklyn over the last year. The pop-up cafe will be open daily from 7 a.m. til the afternoon, and will be “slingling coffee and espresso drinks plus 100% vegan small plates and sandwiches — featuring their crafted vegan deli meats,” pet Trans-Pecos. It officially begins tomorrow, but there’s word of a preview happening today. Meanwhile, Trans-Pecos, where Michael C Hall recently hit the stage with his band, has a full calendar this month, with Thelma and the Sleeze, Pink Mexico, Animal Show, the Down & Outs perfomring tonight and a special benefit for HEART Women & Girls, a sexual health resource center for Muslim communities, at the end of the month. If you wake up with Trans Am cravings next week, just keep in mind that Trans Am West has a location in Phoenix (and it might just be worth the trip).